So.... I put aside "Walking on Water" when challenged to illustrate my "core virtue", which is to say, what it is I am about in this world in whatever form it takes. After a lot of thought, I realized that I want to open people's hearts to the joy inside. 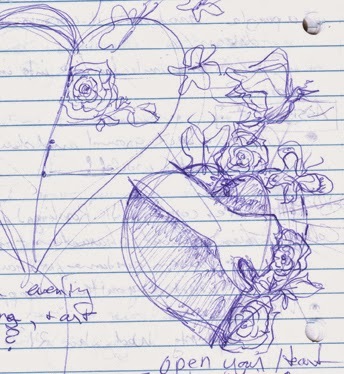 I came up with an image something like heart shaped candy box opening, or like a heart/curtain being pulled back. The next step was to find or dye cloth do use in the construction of the piece, and to find other things that might symbolize joy: bits of lace, buttons, embroidered butterflies, flowers. I searched through the local thrift store, the quilts shop, and the antique dealers. Found many treasures that might make it into the piece! 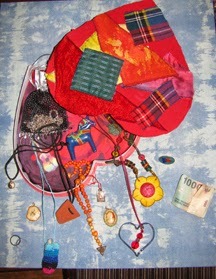 I searched my stash of dyed silks, scraps of brocade, treasured fabrics, and found more treasures! In my stash of silk left over from a massive dying of silks for a fabric show, I found almost the right color of charmeuse silk, and a luscious piece of onion dyed silk velvet. Also a light blue raw silk for the back ground. I dyed the charmeuse a slightly warmer yellow, dipped the velvet in scarlet dye, and the raw silk went into a saphire blue dye pot. While I was at it I made another pot of onion dye and steeped a piece of light blue denim in that for another project. The dyed cloth was steamed and dried. 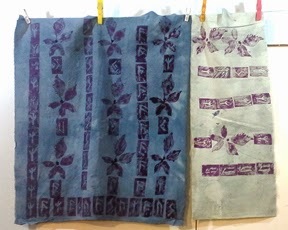 I thickened some purple dye (Jaquard dyes for silk) with xanthan gum (which I use in making gluten free breads) and tried it out with stamps cut from E-Z cut printing blocks. Background and test piece for "Open Heart"
The rune stamps are left over from a project Marj Watkins and I did around her book Rotaida and the Rune Stone. They stand for strength, protection, and clear vision--all qualities necessary if one is to open one's heart. 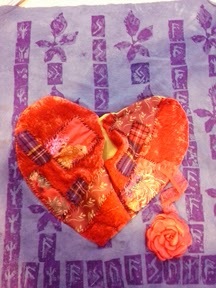 Here is Open Heart still in process (but don't believe the colors in this photo). There will be butterflies and flowers bursting out of the heart. 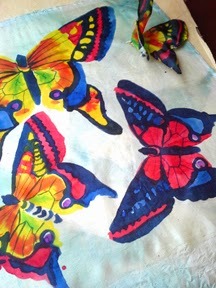 I'm painting the butterflies on antique silk and sewing them onto wire so that they can fly. The flowers will be of silk I have dyed, using patterns I created from artificial flowers. This will be the most 3 dimensional piece I have done since high school! I'll try to give you more photos as this piece nears completion. 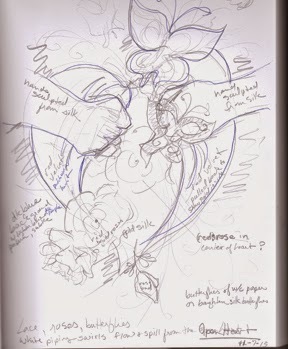 I am also working on several other pieces for the show at the Tea Shop on Vashon: "Story Box", "Toward the Light", and one I may call "Nurtured by Love", or maybe just "Flower". Wow! Gorgeous and exciting. I'm excited to attend the opening and celebrate this new phase of your artistry with you! What does it mean to be a crone?